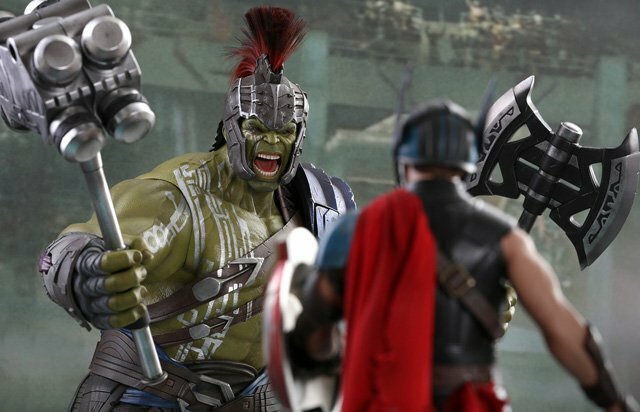 Hot Toys has revealed a first look at its 1/6th scale collectible figures for Thor: Ragnarok, including the Gladiator Hulk and Roadworn Thor figures. Crafted based on Hulk’s appearance in the upcoming screenplay Thor: Ragnarok, the Gladiator Hulk figure comes with newly-developed and interchangeable head sculpts with separate rolling eyeballs, capturing his screaming and angry facial expression with impressive likeness. The figure also features a specially-painted muscular body showing detailed skin texture and tendons, a detachable gladiator helmet with real fur, a detachable hair piece, the highly-detailed gladiator armor, war hammer and battle axe. RELATED: The New Thor: Ragnarok Trailer from Comic-Con! The Roadworn Thor collectible figure is an exclusive item only available in selected markets. The figure captures the impressive likeness of Thor portrayed by Chris Hemsworth in Thor: Ragnarok and features a newly-painted head sculpt, an intricately-tailored new armor, a metal Mjolnir, a blue-colored LED light-up Mjolnir with lightning effect accessory that can be attached to the weapon, and a Thor: Ragnarok-themed figure stand. Additionally, the most distinctive feature of this collectible figure is the Surtur’s skull that can be magnetically attached to the back of the figure along with a metal chain!